a feeling of nostalgia as I come to terms with its closure. Being in other theatre productions however, had prepared me for what to expect during the rehearsals and the production week. With time against us and with so many aspects of the Panto to satisfy, I quickly became accustomed to the intense procedure that the next two months was going to involve. that needed to be considered in order to achieve a high-quality performance. The rehearsals became a learning curve for me, whether that was observing other members of the cast running through a scene and receiving feedback from the director, or from personal trial and error. 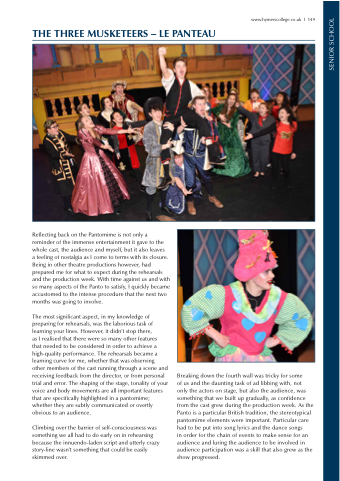 The shaping of the stage, tonality of your voice and body movements are all important features that are specifically highlighted in a pantomime; whether they are subtly communicated or overtly obvious to an audience. Climbing over the barrier of self-consciousness was something we all had to do early on in rehearsing because the innuendo-laden script and utterly crazy story-line wasn’t something that could be easily skimmed over. in order for the chain of events to make sense for an audience and luring the audience to be involved in audience participation was a skill that also grew as the show progressed.